A SUBJECT has many sides, and while we blame a party for its action on one side we may have to praise it for the good it wrought upon another. No praise can be too high for the Puritans in their zeal for the Bible as they understood it. Indeed the English Bible was and is the common ground of Anglicans and Nonconformists, the chief glory of the English Reformation. "For my part," Gladstone has written, "without going farther, I see in the free use of Scripture by the Christian people at large, not for controversy, nor for dogmatic accuracy, nor for the satisfaction of the understanding, but for its milk and meat, the food of the spirit — one undeniable object and fruit of the English Reformation." Unfortunately we may not linger here for long in the consideration of this great subject, since we are only concerned in this History with the Bible as the rock from which the Prayer Book was hewn and upon which it stands. For the wider aspect of the matter let us be content with another extract — this time from a great German historian. Dr. Dollinger says :— " I believe we may credit one great superiority in England over other countries to the circumstance that there the Holy Scripture is found in every house, as is the case nowhere else in the world. It is, so to speak, the good genius of the place, the protecting spirit of the domestic hearth and family." So it is that when as historians we look back upon the past, we see good in both sides of the old controversies. It was the good indeed that made each party live ; for no party lives except for the good in it, and the evil is but lumber that it carries. Those who come after — some time after — are able to separate the good from the evil, and to possess all that is worthy, not from one side only, but from both. Thus the world does slowly grow in wisdom, learning to eschew what is evil and to hold fast what is good. We in this little History may well condemn the evil done by a small gang of robbers in the reign of Edward VI, the narrowness of Puritanism, the arrogance and bitterness of both sides but Puritanism destroyed for us ancient and deep-rooted evils, and helped us to win that freedom to-day which is the main hope of Christendom — the freedom to go back behind the traditions of men to the plain words and pure example of our Lord Jesus Christ. 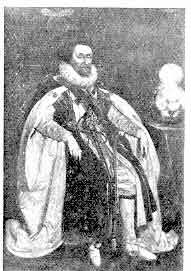 When James I came to the throne, the Puritans drew up a " Millenary Petition " for reform; and as a result the Hampton Court Conference (1604) was held by the King, who loved disputations above all things. The familiar petty objections were raised to the cross in Baptism, to the square cap, and the surplice (" a kind of garment," said they, "which the priests of Isis used to wear") ; the wedding ring, the word "priest," bowing at the name of Jesus; the Puritans also disliked the Thirty-nine Articles as not sanctioning Calvinism; they desired that Baptism should never be ministered by women, that Confirmation should be taken away, and also the Churching of Women, that "examination" should go before Communion, that "the longsomeness of service" should be "abridged" and "Church songs and music moderated," that the Lord's Day should not be "profaned" (by the playing of games), that an uniformity of doctrine should be prescribed, and a few other things. Some of these requests (especially that for uniformity) were very bad indeed, and few would be defended to-day: even that against "longsomeness," we fear, was only to gain more room for sermons and extempore prayers that were more longsome still. King James (who so loved an argument) enjoyed the Hampton. Court Conference very much. He wrote afterwards that he had peppered the Puritans — in his own inimitable words — " We have kept such a revel with the Puritans here these two days as was never heard the like, quhaire I have peppered them as soundly . . . They fled me so from argument to argument without ever answering me directly, ut est earum moris." Poor disputants we can see James smiling and stammering his triumph at their courtly retreat. That retreat was not to be for long. it had the direct sanction of Convocation, which in the new Canons of 1604 ordered it to be used. 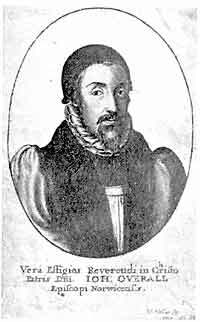 One of the revisers of 1604, and of the translators of the Bible in 1607-11. He was afterwards Bishop of Norwich. The most important addition was the fifth part of the Catechism, that ample concluding section which so admirably defines the Sacraments; this is supposed to have been written by Dr. Overall. The Prayer for the Royal Family — which has often been felt since to increase the longsomeness of Divine Service — was added, though only at the end of the Litany; and the Thanksgivings for Rain, Fair Weather, Plenty, Peace, Deliverance from the Plague, were also put in. On the other hand, to please the Puritans who disapproved of the possibility of feminine ministrations, Private Baptism was restricted to a "lawful Minister" (a term which, strictly understood, does not exclude lay Baptism in case of necessity); the explanatory subtitle to Confirmation, "Or laying on of hands," etc. was added ; and similarly to the title "The Absolution" were joined the words "or Remission of sins." The Puritans had demanded the abolition of all Lessons from the Apocrypha (some of which are of extreme value and beauty); and as a concession, the quaint history of Bel and the Dragon, and the much-loved romance of Tobit were given up. In the same year the Canons of 1604, which had been drawn up by Convocation in 1603, received the sanction of the Crown. These Canons pronounced excommunication upon those, whether Puritans or Romanists, who "impugned" the Prayer Book or refused to use it, and they asserted the historical claim of the English Church to be a part of the Church Catholic. They affected our ritual by enforcing once again the Bidding Prayer before Sermons, and our ceremonial by enforcing the reverence at the name of Jesus, and certain minimum requirements of the Ornaments Rubric — the altar frontal and fair linen, the cope, surplice, hood, tippet (or scarf), and the square cap with cassock and gown, and tippet or hood, out of doors. At the Hampton Court Conference, the learned leader of the Puritan party, Dr. Reynolds, proposed a revision of the Bible. In doing so, he aimed at Puritanism — unconsciously, no doubt — the greatest blow it could possibly receive; for the very source and soil of it was the Geneva Bible of 1560 (known now to collectors as the Breeches Bible), which — printed in modern type instead of black letter — was the popular version of the English people, and, being full of Calvinistic notes, and bound up with a Calvinistic Catechism, spread everywhere the tenets of the Genevan teacher. This fact could not have occurred to the Anglicans present, for the proposal to prepare a new version was ill received. From a painting by Paul Van Somer, in the National Portrait Gallery. One man, however, took up the idea with enthusiasm, and this was the King himself, to whom the first credit of our English Bible is due. Was it that he alone had the shrewdness to see that the impracticable Bishops' Bible of 1568 could never supplant the Geneva Bible, and that Puritanism would continue to spread unless an impartial version of the Scriptures was produced? It may well have been so; for we have James's own words as to his hatred of the Geneva Bible, with its "notes very partial, untrue, seditious, and savouring too much of dangerous and traitorous conceits." His scholar's instinct was aroused as well "for he could never yet see a Bible well translated in English, but the worst of all his Majesty thought the Geneva to be." After the Conference was over, King James drew up a list of fifty-four divines. It is to be remarked that none of them were bishops at the time, though some were made bishops afterwards: the Authorized Version, in fact, owes its excellence to the common sense of the King in choosing his men for their learning and capacity, and not for their official position. This may seem a very obvious piece of wisdom: but it is to be noted that it has been forgotten in our hitherto unsuccessful twentieth century attempts at Prayer Book revision. King James's fifty-four divines were afterwards reduced to the "prodigiously learned and earnest persons, forty-seven in number," who, Carlyle says, gave us our version of that Book of Books, "which possesses this property, inclusive of all, add we, That it is written under the eye of the Eternal; that it is of a sincerity like very Death, the truest utterance that ever came by alphabetic letters from the Soul of Man." One of the translators of the Bible. He was afterwards Bishop of Winchester. The English Bible like the English Prayer Book had had its baptism of blood. Men like Tyndale had been martyred for translating, printing, or circulating it and now, when the generation that had wept over Tyndale and Cranmer was gone, Englishmen, who should have been united in a common cause, were heading for civil war. Yet it was in this age of strife that the uniting spirit of the Bible for a while prevailed. Puritans and High Churchmen had the Scriptures in common, and did alike fervently believe in them: outside the rooms in Oxford, Cambridge, and Westminster, where the forty-seven divines met, religious folk were maligning each other in brilliant, bitter, and abusive pamphlets; but within those learned conferences all hostilities were silenced, all differences ignored: men like Overall and the saintly Andrewes, on the one side, joined with Reynolds and Abbott on the other; and the forty-seven worked in such singular harmony that it is impossible even to distinguish between the three companies which worked in three different places: the Authorized Version of the Bible reads like the work of one great man. tears of Jeremiah, the visions of Ezekiel, the preaching of the Minor Prophets, the narrative simplicity of the Gospels and Acts, or those "blazing passages in the Epistles, and the hues of sunset and eclipse that colour the Book of Revelation." Yet through it all runs the constant music of what has been called the biblical cadence. The divines — who might have wrought a literary gem for the bookshelves of the learned, after the manner of the age that produced Donne and Milton, Burton and Sir Thomas Browne — threw aside the pedantries and preciosities which were in fashion, and sat humbly at the feet of those predecessors who in peril of death had hewn out the words of life with such strength of simplicity; and they produced a book which has been at once the comfort of the peasant and the model and inspiration of our greatest writers. They were fine scholars. Scholars are not uncommon, and that was a very learned age. But it was also a great age of English literature: Shakespeare had just turned forty when King James appointed the Divines (it was the year of Othello, and two years after Hamlet); the second edition of Bacon's Essays was published a few months after those Divines had finished their work, and Milton was then in the fourth year of his precocious childhood. Now scholars are not generally masters of prose, and the combination of the critical and the constructive gift — of science and art — is almost unknown to-day, when learned translations and exact commentaries are common enough, but the majority of ancient books have still not been turned into English classics. The English Bible is an exception. We do not think of it as a translation at all: we think of it as the greatest of English classics, which, among other things, it is. King James's forty-seven Divines, appointed in 1604, got to work in 1607, and produced the Authorized Version of the Bible in 1611. When we consider their work and the earlier masterly exemplars whom they followed, Wyclif Tyndale, Coverdale, and the rest — when we contemplate the earnest courage, the humble faith, the perseverance of these men, and the undying majesty of their common offspring, we can only say that, if there is such a thing as the inspiration of the Bible, there has also been such a thing as an inspiration of those who translated it. And what is true of the English Bible is true also of the English Prayer Book. Scholars who won the consecration of martyrdom gave to it a like power of inspired translation, and endowed it with the magic of their prose. Thus it is that the one book worthy to be set side by side with the English Bible is that Book of Common Prayer, which has won a place in the heart of the Anglo-Saxon race second only to the Bible, and which day by day issues it forth in psalter and lectionary to the people. English Versions of the Bible. 7th to 14th Centuries. The Pioneers: Caedmon, Bede, Ælfric, and others (in Anglo-Saxon), Shoreham, Rolle, and others. C. 1385. Wyclif. Manuscript copies in Middle English, translated from the Latin. 1525. Tyndale. New Testament, translated from the Greek. Also Pentateuch and Jonah, translated from the Hebrew. 1535. Coverdale. The first complete printed Bible in English. Translated from the Latin and German, but based upon Tyndale. 1537. Matthew's Bible. " Matthew" is a pseudonym, and perhaps stands for Tyndale. 1539. The Great Bible. (See p. 40.) By Coverdale, based on "Matthew." The 2nd edition (1540) and the five subsequent editions (1540-1) have a preface by Cranmer. The Prayer Book Psalter is from this Version. 1539. Taverner's Bible. Little circulation or influence. A revision of" Matthew." 1560. The Geneva Bible. The popular household Bible for a century, i.e. for long after the A.V. of 1611, because a handy volume, in roman type, and divided into verses. Made by the Protestant exiles in Geneva, and thus Calvinistic (p. 103), but scholarly, and of great influence on the A.V. 1568. The Bishops' Bible. A revision of the Great Bible by Archbishop Parker and other bishops. A cumbersome book and no rival to the Genevan Bible, but the basis of the A.V. 1609. The Douai Bible. The Roman Catholic Version. The N.T. was published at Rheims in 1582, the O.T. at Douai in 1609. Closely follows the Latin. 1611. The Authorized Version. Based on all previous translations, done by six committees, an O.T. and a N.T. committee at Westminster, Oxford and Cambridge. 1881-5. The Revised Version. Done by a joint committee of Churchmen and Nonconformists. Not content with the corrections required by modern scholarship, the committee hampered itself with bad rules and produced a version inferior to the A.V., though valuable for reference and study. This chapter must end in gloom. In 1637 a Scottish Prayer Book, with many improvements and a few concessions to Puritan feeling, was printed at Edinburgh. Its most distinctive features were due to the Scottish bishops, Maxwell of Ross and Wedderburn of Dunblane. Charles I favoured and influenced it. Archbishop Laud had wished to introduce the English Book into Scotland, and the Puritan enemies of the Scottish Book succeeded in damaging the latter book by coupling Laud's name with it. This Scottish Book had afterwards considerable effect upon the last revision of the English in 1662, and was destined to give us the beautiful Scottish Liturgy and the Liturgy of the American Church. But its introduction in Scotland in 1637 was made the occasion of a riot, which was followed by the overthrow of Episcopacy, and so the book did not have a fair trial there. THE PORCH AT THE UNIVERSITY CHURCH, OXFORD. 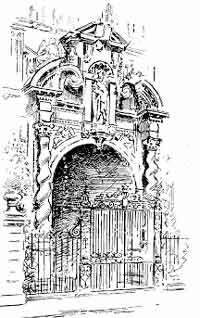 The responsibility for setting up the statue of the Virgin and Child over the porch was laid upon Laud as Chancellor, and was made one of the charges brought against him at his trial. In 1640 a new code of Canons was issued by Convocation, one of which enjoined bowing to the altar; but in the same year the Long Parliament met, and condemned the Canons — among other things. In 1645 Laud was brought to the block to be followed four years later by his royal master. On the day of Laud's arrest, March 1st, 1641, a committee was appointed which demanded the abolition of altars, candlesticks, pictures and images, vestments, and the Ornaments Rubric by which they "are now commanded," and many Church ceremonies; but the destruction went further, and the ruined condition of our churches a century ago was far more due to the Puritan iconoclasts than even to the Edwardian robbers the organs were burnt, the stained glass was smashed, the churches used to stable horses. We get some idea of what was done by the records of the egregious Will Dowsing, who was the agent of the Cromwellian government for smashing churches at 6s. 8d. each he has left us the proud record of his doings in parish after parish, and even notes with disgust that at one place he got only 3s. 4d., because there were no more than "ten superstitious pictures and a cross" to be destroyed. This was at Hardwick, near Cambridge, in 1643. At the neighbouring village of Toft he expected more than his accustomed fee for a "purification" of the church rather heavier than usual, but was disappointed, and got "only 6s. 8d." for destroying "twenty-seven superstitious pictures in the windows, ten others in stone [the beautiful alabaster reredos, fragments of which are still preserved in the church], three others in stone, three inscriptions, Pray for the souls, divers Orate pro animabuses [sic] in the windows, and a bell Ora pro anima Sancta Katharina." At Queens', Cambridge, he tells us, "we beat down a 110 superstitious pictures, besides Chirubims"; at Peterhouse, "we pulled down two mighty great Angells with wings, and diverse other Angells, and the four Evangelists, and Peter with his Keies over the Chapell Dore, and about 100 Chirubims"; and the unhappy college authorities had to pay him themselves for ruining their chapels. It was only by some unknown private intervention (was it Milton himself who interceded with Cromwell?) that "the storied windows richly dight," of King's College Chapel were spared to be the wonder of succeeding ages for it is on record that the Bursar of King's paid the extra heavy fee for their destruction. These things need emphasizing; for the desolation of our churches until recent times is commonly supposed to have been due to the English Church. It was due to her enemies; and was caused, not by the Prayer Book system, but by the destruction of that system. England lay under a military dictatorship which denied it the opportunity of telling its mind by a parliamentary election. Cromwell's followers are often praised as the pioneers of freedom it is more true to say that they were the destroyers of royal autocracy and of the hereditary divine right of kings ; but beyond this they did not secure freedom, nor in the case of the Church did they at all desire to allow it. On January 3rd, 1645, the day of Laud's attainder, the Long Parliament by an Ordinance took away the Book of Common Prayer, and established in its place the Directory, a manual of directions for the meagre framework of Puritan worship. On August 23rd, another Ordinance forbade the use of the Prayer Book, in any "public place of worship or in any private place or family," and fixed a penalty of five pounds for the first offence, ten for the second, and for the third "one whole year's imprisonment without bail or mainprize." 1603. March. Accession of James I. 1604. January. Hampton Court Conference. February. The Fourth Prayer Book. 1603-4. The Canons of 1604. 1604. King James appoints the Divines to revise the English Bible. 1607. The six committees of Divines begin their work. 1611. Authorized Version of the Bible. 1634-60. Destruction of Church Ornaments, including stained glass windows. 1637. Scottish Prayer Book introduced. 1645. January 3rd. The Prayer Book abolished by an Ordinance, and the Directory established. January 1oth. Execution of Laud. August 23rd. Use of the Prayer Book even in private made a penal offence. 1649. January 3oth. Execution of King Charles I. 1660. Restoration of Church and King, of free Parliamentary government, and of the Prayer Book.